Though surpassed in poetry and prose style by the very modernists they failed to appreciate, though surpassed in technical sophistication by any number of distinguished academic philosophers and theologians, the Inklings fulfilled what many find to be a more urgent need: not simply to restore the discarded image, but to refresh it and bring it to life for the present and future. Last night I was complaining about the length of this book, but it turned out as I speculated – about 35% of its body is end notes. Still, it’s a big book. But it’s well worth reading, if you’re interested in the social and intellectual matrix that produced some of the 20th Century’s most influential Christian writing. The Inklings began as an Oxford student literary group in 1932, but when the students had graduated and moved on, C.S. Lewis, J.R.R. Tolkien, and other friends who had been invited to join carried it on as a sort of cross between a writers’ criticism group and a social club. They met once a week in Lewis’ rooms at Magdelen College for the writing phase, and again at the Eagle and Child pub for the more social part. They carried on, with some changes in membership, until the 1960s. 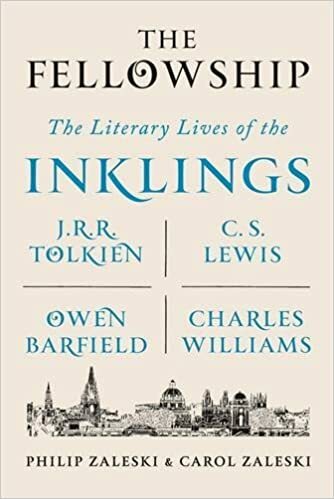 The Fellowship: The Literary Lives of the Inklings, by Philip and Carol Zaleski, concentrates on the lives of the four best-known Inklings: J.R.R. Tolkien, C.S. Lewis, Charles Williams, and Owen Barfield. Much of the material covered will already be familiar to fans, but Williams’ and Barfield’s lives are far less known, and there’s plenty of material that will be new to most readers (there certainly was for me). I did not know, for instance, the Tolkien had suffered an injury to his tongue in his youth, which caused him to mumble when speaking (this impediment disappeared when he was “performing,” as in his famous LOTR readings recorded by George Sayer). I didn’t know that Owen Barfield was baptized as an adult into the Anglican Church (though he continued to believe in reincarnation and other Anthroposophist doctrines). Remarkably, there’s even some movie trivia – one discovers connections between the Inklings and David Lean, Julie Christie, and Ava Gardner. I shouldn’t have been surprised to learn of tensions within the group. Hugo Dyson and Owen Barfield disliked Tolkien’s Middle Earth materials. Tolkien loathed Lewis’ apologetics books. Barfield, though not embittered, chafed most of his life at failing to achieve the academic and literary success of his friends, who included some of the most prominent writers of the 20th Century (T.S. Eliot as well as the Inklings). Only in old age did he break free of his hated legal career and become a scholarly celebrity. Charles Williams had a secret life that he kept well hidden from his friends, one that would have shocked them had they known of it. The authors indulge in criticism from time to time, which sometimes annoyed me (though I admit I’m a fan boy and lack objectivity). But at other times they defend their subjects from perceived injustice on the critics’ part. I liked The Fellowship very much, and profited from reading it. Recommended. Could you navigate the end notes in an ebook with links and such? It doesn’t seem to be set up that way. I didn’t see note links at all. Didn’t notice until you asked, but yeah, the notes are inoperative, at least on my Kindle. If you know them, how did you find this in comparison with the two previous group biographies – by Humphrey Carpenter and Diana Pavlac Glyer? while I love both of these – I felt The Fellowship was now the best first book to read about The Inklings. Sorry, I haven’t actually read those books.